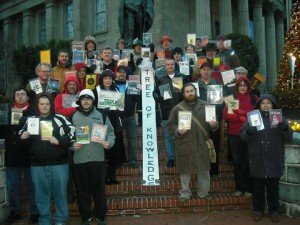 The Freethought Society (FS) continues to demand the right to display a Tree of Knowledge on the grounds of the Chester County Courthouse. A 2012 display request will likely be denied, there­fore supporters must be prepared to conduct a “Human Tree of Knowledge” event/protest rally. The event/protest rally schedule will include the distribution of ornaments and participants will be invited to say a few words about how much certain books mean to them. Please plan to participate on Saturday, December 1, 2012 at the Chester County Courthouse located at the corner of High and Market Streets (2 North High Street, West Chester, Pennsylvania). The event will start at 3:00 PM and will include speeches, singing, photo opportunities and a press conference. 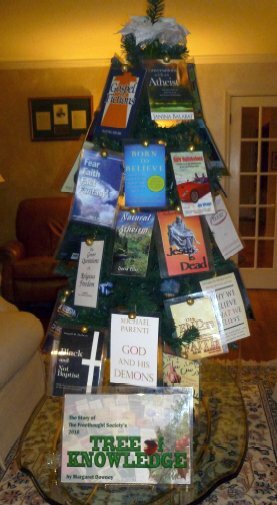 Should the FS petition to include The Tree of Knowledge in the 2012 display be approved, an actual tree will be decorated. FS supporters will be notified by email, and/or a notice will be posted on the Freethought Society listserv and website. At 5:30 PM, a post-event dinner (Dutch Treat) will take place at Kildare’s Irish Pub, located at 18 West Gay Street, West Chester, Pennsylvania, 19380. The restaurant is located just one block from the Chester County Courthouse. For directions to the restaurant call, (610) 431-0770. To reserve dinner seats, please call the FS office at (610) 793-2737 by November 28, 2012. PLEASE RSVP via our Meetup or Facebook pages! 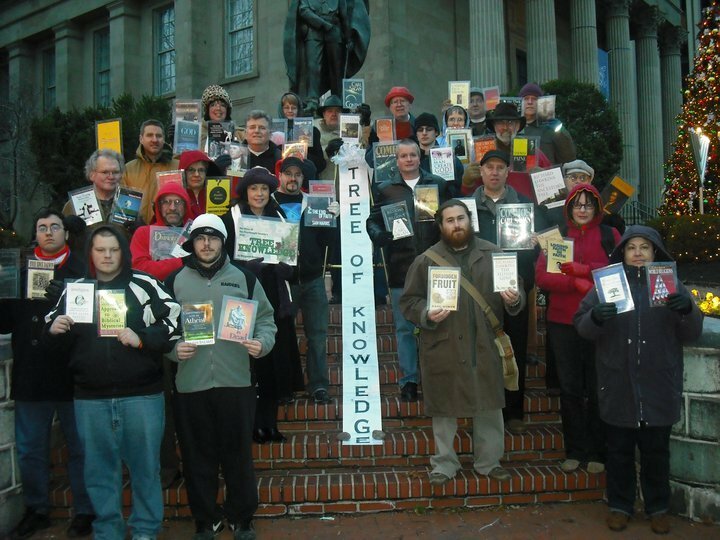 Note: This event is related to the Human Tree of Knowledge event in West Chester, PA, on Dec. 1, 2012. FS and Phila Ethical Humanists join together to celebrate the season. FS invites you to gather with us for a Tree of Knowledge decorating holiday event scheduled to take place on Sunday, December 2, 2012 at the Ethical Humanist Society of Philadelphia (EHSP), located at 1906 South Rittenhouse Square, Philadelphia, Pennsylvania. Please attend the Taft-Morales presentation to learn more about what you can do to uphold the Jeffersonian Wall of Separation between religion and government. After the presentation, a 10’ tall Tree of Knowledge will be decorated and placed on display in the foyer of the Ethical Society Building. Refreshments will be served. PLEASE RSVP via our Facebook or Meetup Pages!